Facebook's suite of advertising executives were on full display Tuesday afternoon, as the company met with journalists to talk (somewhat) candidly about Facebook's advertising products. In her opening remarks, Facebook COO Sheryl Sandberg said, "businesses need to catch up" to the trend that's shifting traffic to mobile. "Mobile is both a challenge and an opportunity for businesses, and especially for small businesses around the world," she said. "From the largest brand to the smallest mom and pop shop, everyone knows that to reach people where they are, mobile is a big opportunity. But it's hard." On Tuesday, Facebook announced it now has more than 4 million advertisers, with more than 70 percent coming from outside the U.S. Of those using the platform around the world, the fastest growing region is Southeast Asia, in countries such as Vietnam, Indonesia and the Philippines. European nations like Greece and Ukraine are also growing quickly. Mobile also continues to be a focus, with more than 85 percent of business pages using mobile and 40 percent of active advertisers creating ads for mobile. (According to Facebook's second-quarter earnings, 85 percent of the company's $6.44 billion in ad revenue came from mobile devices.) However, a third of small businesses in the U.S. still don't have any sort of internet presence. Less than a week after Facebook made headlines for miscalculating video metrics for advertisers, the company downplayed the significance of the error, which persisted in some cases for as long as two years and inflated metrics by as much as 80 percent. Sandberg said Facebook uses 14 different video metrics to track ad campaign spending effectiveness and said that all but one were being calculated correctly. However, she said one thing that could help in the future is if the overall tech and advertising industries were to come up with a more uniform way of measurement that helps keep the "entire medium" accountable. Just a day or two before the video metrics news became public, Facebook announced a number of new partnerships focused on letting advertisers receive measurement from third parties. 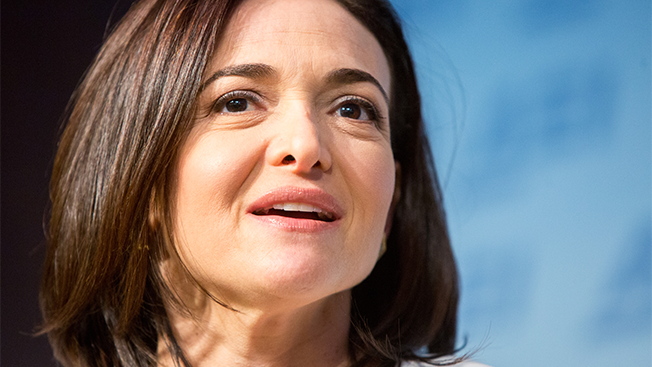 "There is very universal agreement that the industry needs to evolve to metrics that matter," Sandberg said. "And the beauty of the mobile environment, because it's a personal device, we have the ability to measure things in a way that we could not before on any other medium." Sandberg said Facebook is still focused on growing the use case of livestream and Facebook video. She said it's still in the "really early stages" of monetizing video. Carolyn Everson, Facebook's vp of global marketing solutions, pointed to recent marketer experiments with live video such as General Electric using it during the Summer Olympics in Brazil. Facebook is continuing to experiment with autoplaying sound and leaving it off when it comes to both user and advertiser videos. Everson said on average, 50 percent of time spent with Facebook video is with sound on. That includes both consumer and marketer videos. Facebook has been working with advertisers to develop creative that is both relevant with the sound on and sound off. She said Facebook has begun a small test in Australia that allows sound to be automatically played, but nothing has been rolled out much farther than that. "I think marketers in this mobile environment need to think about both sound on and sound off considerations as they look at their creative canvas," she said.